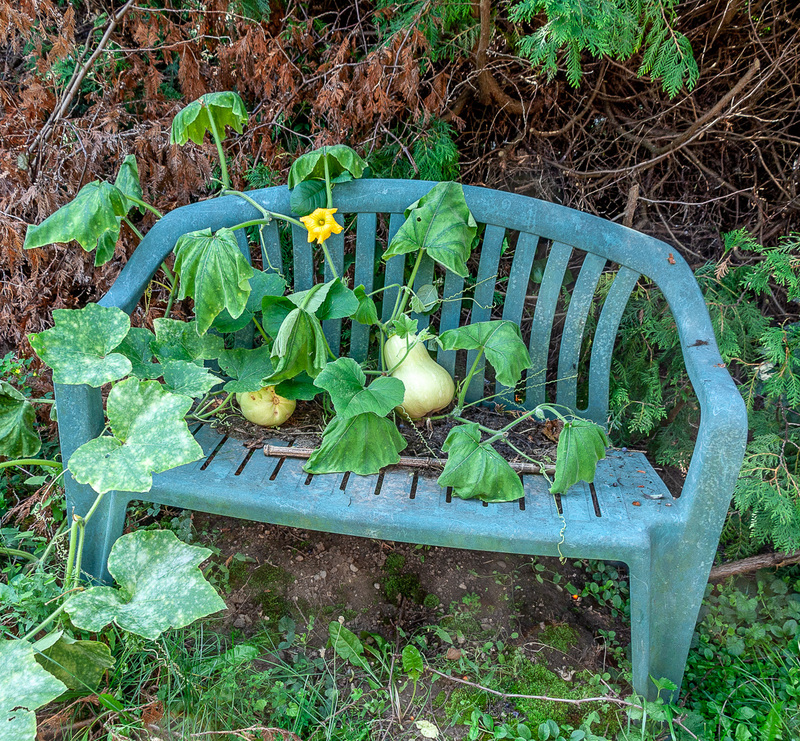 These squash just climbed up and helped themselves to a seat. The title for this series of posts started out as "Preparing for collapse", but in my last post I immediately went into a rant about how I see a hard, fast, world-crippling collapse as pretty improbable. What I'm observing instead is a slow collapse that has already been happening for several decades and will continue for several more, albeit with much the same end result as a fast collapse. KMO, one of my favourite podcasters and a follower of this blog, suggested a better title would be Responding to Collapse, and that's what I'll be using from now on. Thanks, KMO. Of course, I expect that the degree of collapse will become more intense as time passes, and it is that which we should try to prepare for (or respond to). Times will become gradually harder and occasionally bad things will happen that make things quite a bit worse all at once. But things will be much worse in some areas than others and if you are clever you can arrange to be where you'll miss the worst of it. Though if you think you can arrange to miss all of it, you're kidding yourself. Over the next few posts I'll be offering some rules of thumb for surviving collapse. But always remember not to follow any rule off a cliff. Look at your own current circumstances and adjust my ideas fit. All of what I am suggesting here only works if the great majority of people ignore my advice or, more likely, never hear it in the first place. One of our biggest problems, now and for quite a while yet, is that there are too many people living on this planet. If a great many people where to head in the direction I am pointing, the advantage of being there would immediately go away. This is already starting to play out in some parts of the world where things are getting bad enough politically, economically and/or climate-wise that many are leaving in desperation. I am talking about places like the Middle East, North Africa, Venezuela and to some extent even Puerto Rico, where people are leaving for the mainland U.S. in droves. As the numbers of refugees mount the welcome they receive gets less enthusiastic. But bear in mind that the only real choice you will have in this situation is to be part of the influx of refugees or to be among of those who are welcoming it. I would say that the latter role is very much preferable. A timely move, before things get serious, can put you on the right side of things. And those of you who applaud their government for clamping down on immigrants and immigration, consider this: if your government is so ready to mistreat "those people", how long will they hesitate to treat you similarly when it becomes convenient? Better to take part in the political process (vote, as a minimum) and work towards a government with more humane and progressive policies. Some of those bad things that might make you want to move will be caused by climate change and today I'd like to focus on the negative effects of climate change, specifically higher temperatures and changing rainfall patterns. I should say in advance that if you are in denial about climate change, please go somewhere else where you'll be more welcome. I simply don't have the energy or inclination to engage with you. As far as I am concerned it's happening, we're causing it by adding CO2 and other greenhouse gases to the atmosphere, and it's going to get worse for quite a while yet. Especially since it doesn't seem like we are going to do anything about reducing green house gas emissions until collapse forces us to drastically reduce our use of fossil fuels and our level of consumption in general. At the same time, I give very little credence to those who talk about near term extinction of the human race. That's way too much of an easy way out, and little more than an excuse for inaction. Much of how we have come to live over the last few thousand years was determined by the climate, which has been fairly stable and accommodating to the way we practice agriculture. Based on this, we have been a very successful species, at least if you judge by how we have spread over the planet and how our population has grown. During the last couple of centuries energy from fossil fuels has enabled us to become even more "successful". We have overcome some challenges that had previously been insurmountable and managed to feed an ever growing population. The Green Revolution involved some "improved" plant varieties that give startlingly better yields in response to optimized irrigation, fertilization and pest control, all of which have been facilitated by the ready availability of cheap energy. Unfortunately, this has involved the use of non-renewable resources such as fossil fuels, the water in fossil aquifers, and deposits of potash and phosphorous. We've managed to live and even farm in areas that were previously deserts. and we've been able to ship food from all over the world to areas where the population couldn't even remotely be supported by local agriculture. But the days of cheap fossil fuels, fertilizers and pesticides, abundant fossil water, and low cost worldwide shipping (with refrigeration as needed) are coming to an end at the same time as the climate is going crazy. We're are going to have to adapt as best we can. So, let's have a closer a look at the consequences of climate change. There is no doubt that the climate is warming worldwide and will continue to do so. That warming is much more intense in the high latitudes, leading to melting of major ice shields in Greenland and Antarctica. Mountain glaciers are also melting and disappearing at an alarming rate. To make matters worse, the water and land exposed by melting ice is much less reflective that the ice was and retains more of the heat from the sun rather than reflecting it back into space, leading to even more warming. Ice is only about 89.5% as dense as sea water. This is why about 10% of the mass of an iceberg sticks out of the water, and why when ice floating in sea water melts, it does not change the level of the water. So the ice covering the Arctic Ocean will have no effect on sea level as it melts. But ice sitting on land does increase sea level when it melts and runs into the sea. This is true of the ice in Greenland and in mountain glaciers, and of much of the ice in Antarctica. The loss of mountain glaciers also effects the way in which precipitation is stored and flows into rivers and we'll get to that in a moment, but for now, let's concentrate on sea level rise. Interestingly, sea level isn't the same everywhere. When we speak of altitudes "above sea level" we are talking about "Mean Sea Level", which is an average level of the surface of one or more of Earth's oceans. But what we are concerned about here is the actual sea level at any particular location, and this can differ quite a bit from one location to another, and from one time to another, as the sea is in constant motion, affected by the tides, wind, atmospheric pressure, local gravitational differences, temperature, salinity and so forth. In addition to melting ice, sea level has been increasing during at least the last century as the oceans have heated up due to climate change. Further, many human settlements are built on river deltas, where subsidence of land contributes to a substantially increased effective sea level rise. This is caused by both unsustainable extraction of groundwater (in some places also by extraction of oil and gas), and by levees and other flood management practices that prevent accumulation of sediments from compensating for the natural settling of deltaic soils. Here is an interactive map that illustrates what areas will be flooded as sea level rises. You can select the amount of rise and scroll around and zoom in to see the effect on the parts of the world that interest you most. When I initially looking at that map, even with the sea level rise set to the highest level, it didn't seem all that bad—there will be lots of dry land left. But, zooming in and giving it a little further thought, I realized that the missing piece of information is what currently occupies the relatively small areas that would be flooded—a whole lot of people, many of whom are living in the world's largest and most economically important cities. It's hard to nail down how many people will get their feet wet for any particular increase in sea level, but I did find one article that discusses this in some detail. "Current estimates for the absolute maximum sea level rise, if the glaciers at both poles melted, range from 225 to 365 feet, with the latter being more likely accurate. If sea levels rose that much, coastal lands would be depressed several meters and transgressive erosion would also occur. So, for instance, even though Long Island has many points that are above 300 feet or so, none of it would survive the transgressive erosion because it is all glacial till. It is hard to extrapolate from the numbers above to a 100+ meter rise, and improper to do so, but consider that if the human population is concentrated near the seas, and 10% live below the 10 meter line, then it is probably true that well more than half live below the 100 meter line, and many more within the area that would be claimed by the sea through erosion and depression." Clearly, you'll want to be away from the seashore. But you don't want to jump from the pan directly into the fire, so we need t look at what other climate change related problems you might face farther inland. In an attempt to increase the content value of this post, I found some more maps which illustrate the effect climate change is going to have over the coming decades. 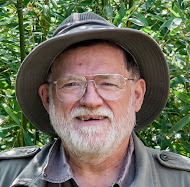 Climate change is a global problem, but in my search it became obvious that quite a lot more information is available for the U.S. and Canada, and since many of my readers are from North America, I'm including some of that information here. Tropical storms can do quite a bit of damage fairly far inland—look at what Maria did to Puerto Rico—even the mountainous inland parts of the island. This is something to take into consideration if you currently live in the Caribbean, near the gulf coast of the U.S. or near the eastern board of the U.S. Tropical storms in the Pacific and Indian Oceans are not something we hear much about in the mass media in North America, but they do happen and have lots of potential for damage to human settlements. If you live where this happens you're probably well aware of it and can take it into account in your plans. People are often proud of the way they have managed to rebuild after storms, and this is fine if you're talking about storms that only happen once a century or so. But as storms become more frequent the financial resources to rebuild every few years will dwindle away. The best time to move is when things have recovered nicely from the most recent storm, but well before the next one. Of course, if it looks like recovery isn't going to happen, then it's time to get out, regardless of the cost. It always astonishes me the way people are willing, perhaps even eager, to build or move into accommodation on the floodplains of rivers. The story is always that the river floods only very rarely and hasn't flooded in a long time. Now that sounds to me like a promise that flooding can be expected shortly even without climate change. But as climate change brings more violent storms even outside the tropics and changes in the pattern of precipitation and spring melting of the winter snow pack, more frequent floods are a certainty. So don't be fooled when moving into a new area—stay away from floodplains and areas likely to be undercut by erosion. Heat waves are becoming more common everywhere, but particularly in the tropics. Many areas will eventually get to the point where they will be uninhabitable for large parts of the year if you don't have air conditioning or housing designed to cope. As always, the poor will be hardest hit. The lack of water can be just as much of a problem as too much. Already deserts are expanding and they will continue to do so, consuming the semi desert areas surrounding the desert where people have been living and are now forced to leave. This is already happening in North Africa and the Middle East and is the root cause of a lot of political unrest. Droughts are becoming more common and are striking areas that traditionally have not suffered droughts. The Pacific Northwest, including California and British Columbia, is one such example. Even areas such as the one where I live, which is getting slightly more precipitation overall, are suffering from changes in when the precipitation happens. In the case of southern Ontario, we're getting more precipitation in fall, winter and spring but less in the summer. This is a problem for agriculture hereabouts, which has traditionally relied on getting a sufficient rain in the summer. There are areas in the southwest of the U.S. that have traditionally been seen as deserts, but during the twentieth century were made to bloom, using water from pump from fossil aquifers and rivers dammed and diverted. Unfortunately the aquifers are just about depleted and all the water in the rivers is being used while demand still grows. As precipitation decreases and temperatures increase even at higher altitudes, there is less accumulation of snow and glaciers melt away, meaning that rivers fed by melting snow and ice run dry earlier in the summer, if they run at all. There is a great deal to be said about areas outside of North America, but this would require a lot more research on my part and delay the publication of this post even more. But I was reading recently that Spain and Portugal are experiencing a severe drought, and it is expected to get worse. People have difficultly responding rationally to these sorts of problems. Slowly increasing temperatures, slowly rising sea levels and slowly spreading desertification are the kind of thing that we tend to let future generations worry about, thinking it's not going to happen here, not just yet anyway. Then one day it does happen and many are caught unprepared. Catastrophes that happen irregularly and unpredictably, like storms, heat waves, droughts and forest fires, are the kind of thing we live through and convince ourselves won't be happening again anytime soon. But as climate change progresses, they will become ever more frequent and more difficult to recover from. Don't be caught in denial—where ever you are, you'll be experiencing some negative effects from climate change. But in some places, those effects will be overwhelming and the only viable response is to move away. Better to be well ahead of the rush. If you own property, better to get it sold while there are still buyers who haven't caught on to what's happening. In addition to the problems caused by climate change, the other two main concerns of this blog (resource depletion and economic contraction) are going to see most of us becoming quite a bit poorer, and not relying on anything that uses much energy, including shipping things in from far away. Most of our own food will have to be grown locally and the smaller amount of "stuff" we consume will be made locally. In a future post (coming soon) I'll be talking about coping with the challenge of finding and fitting into a community that can survive under these conditions. For now I'll just say don't assume that collapse will relieve you of the necessity of earning a living in the growth based capitalist economy. It's going to take a long time to switch over to a low energy, low consumption, non-growth economy and in the meantime, most of us will have to keep a foot in both worlds, and initially mainly in the currently existing world. So any plan for a move will have to take into account the necessity of earning a living where ever you go. You may well find that the pressure of earning a living pushes you in the opposite direction from what collapse related planning would indicate is best. Next time I'll look at the socio-economic side of things—the problems caused when we are surrounded by too many people and by too few, often at the same time. Always food for thought Irv. I see, but don't predict, that collapse is coming in three phases, the longest the grumbling as the structure is stressed. We are in that phase now and have been for some decades although people can write it off as "bad luck", "bad government" or blame foreigners and immigrants for the apparent decline. The next is the cracking phase where the serious structural members such as rule of law and more liberal governments begin to fail, but not all at once and the torrent phase where the structure is stressed past its ability to stand and falls. The length of the cracking phase is uncertain, as is the grumbling phase, but the torrent will develop quickly and be horrible. As you know from After the Last Day, I think a quick collapse may be the only hope for a more optimistic outcome, although as you emphasise here, climate change is likely to be the dominant factor in any survival. I will PM you on FB to arrange the overdue get together. Yes, lets get together soon! I eagerly await you message. Those three stages sound good to me, though I tend to think that by the time when any particular area gets to the torrent, things will have been "leaking" for so long that the "flood" will be somewhat of an anticlimax. I also suspect there will be a time, still decades away for most of us when our still growing population outpaces the shrinking capacity of agriculture to feed us. For a little while after that there will be a lot of hungry people, and then, sadly, a lot of dead people. Of course this won't happen all over the world at once. More like the localized famines we have today, but bigger and the rest of the world will be in bad enough shape that there won't be much help forthcoming. Once again, lots of refugees. Thanks for your kind words, here and on Facebook. One thing I left out of that post, that was drawn to my attention by an article on the difficulties the poor and homeless have had recently evacuating in the face of hurricane Florence. It's all well and good to talk about moving, but many don't have the resources to do so. Even if you're one of the growing number of people living out of their vehicles, you still may not have the price of a tank of gas. But I guess even for those in such hard straits, a planned move would go better than a last minute emergency evacuation. More on that in my next post. Global fertility rates are crashing. I wonder how that will affect the future? It does seem that global fertility rates are decreasing, but there is going to be a big time lag before that leads to a decrease in population. Most predictions that I've read are saying that our population will be around 10 billion by mid-century and higher than that before it levels off sometime late in this century. Only after that will it begin to decrease. If "Business As Usual" had any chance of continuing through this century and beyond, then that eventual decrease in population would indeed be a matter of some concern. But I don't think it's going to happen. I am expecting an economic crash fairly soon, which will drastically reduce standards of living and rates of consumption in the developed world. I expect we'll get through that better than most collapse aware people think. But sometime after that the industrial agriculture system will crash due to depletion of fossil fuels and phosphorous, and the human population will fall to a few hundred million people. One thing to keep in mind is the need for solidarity within a community. This means that to really be integrated within a community one should be a resident for many years. The best time to move would have been a couple of decades ago at least. If hard times closely follow the arrival of new residents, there may be some resentment from the "old-timers". Some tight knit communities require multi-generational residence before one is truly "local". Another thing to remember is that the oceans are a great moderator of temperature. The specific heat of water is so great that a small land area closely surrounded by ocean cannot develop the extremes of temperature that continental landmasses are subject to. This means that even tropical islands may not get too hot. Consider also that in many ways elevation equals latitude. Three hundred miles north is roughly equal to 1000 ft up. The easiest way to move 1000 miles north might be to move up on a mountain by about 3,100 ft. Finally, keep in mind that collapse is likely to cause great economic and political stress. This means that war becomes more likely as stresses accumulate. There might be an area with great potential for avoiding the worst aspects of climate change, but if it is downwind of a major metropolitan area it may be subject to the knock-on effects of a nuclear war. You are certainly right about the amount of time it takes to be seen as an integral part of a community, as opposed to a newcomer. I've been here since 1982 and am just starting to get settled in. Fortunately my wife's family has been in the area for several generations, which makes a big difference. If one is planning a move to a more collapse friendly location, it would definitely be better to get it done ASAP and then exert great efforts to take an active and positive role in the community before it is too late. And in the process not come off like you think you're superior to the locals or have too many unconventional ideas. You are also right abut the moderating effect of the ocean on temperature, but with rising sea levels, many islands will be awash and as such, no longer viable places to live. Tropical islands also tend to find themselves in the path of violent storms, and will do so even more often as climate change intensifies. Up to a point, conflict will intensify in many parts of the world. But as the economy continues to contract, at some point resource to maintain such conflicts will be in short supply. Already, the US is crippling itself with its military ambitions, and accomplishing very little in the process. But as large scale conflicts dwindle, social unrest will grow, especially in cities with large poor and disenfranchised populations. Much of this will be the subject of my next post, which should be ready sometime in the next couple of weeks.